Like many, many Americans, I am entirely and utterly swept up in the cultural phenomenon of our time – meaning I can’t get enough of Lin-Manuel Miranda’s Broadway musical Hamilton. That is really all there is to say. Introducing the cast for a performance at the White House, Michelle Obama said that Hamilton is the greatest work of art in any genre that she has ever encountered. And numerous theater directors and scholars compare Miranda to Shakespeare in his ability to bring history to life through colloquial verse. The show won the 2016 Pulitzer Prize for Drama and was nominated for a record-setting sixteen Tony Awards, winning eleven. Miranda not only wrote the lyrics and music for the show – but also starred as Hamilton, receiving the Tony for Best Actor in a Musical. In 2015, the same year Hamilton debuted on Broadway, Miranda was awarded a MacArthur Fellowship – known by many as the MacArthur genius award. What’s all this fuss about a Broadway show? Why do I and so many others love Hamilton? Is Hamilton a great work of art? And is Miranda a Shakespeare? Well. For starters, Hamilton truly brings the American Revolution and the founding of the United States to incredibly vivid life. Alexander Hamilton gets his due – in many ways, his long-overdue credit. Sure, he graces the ten-dollar bill, and high school students who are paying attention know that he founded the U.S. Treasury. And who isn’t captivated by the story of the Burr-Hamilton duel? (We think, “Really?! They settled their differences with duels?! That’s even more outlandish than attacking your opponents via Twitter!”) But as Miranda makes clear, Alexander Hamilton contributed so much more to our fledgling country. But Hamilton is more than a history lesson. Zoom ahead about 240 years and produce the show now, and you get hip-hop – exuberant, fierce hip-hop full of verbal pyrotechnics. I do not consider myself a fan of rap or hip-hop, but after immersing myself in the Hamilton CD, I am starting to be converted. The linguistic dexterity and wizardry are not to be believed. Take a listen – you’ll see what I mean. And for insights into the many ways Hamilton pays homage to the greats of hip-hop, study the annotated libretto. Now, put 1776 and 2017 together, one era reflecting back on the other, and you can’t help but see the parallels to the #blacklivesmatter movement, the movement for immigrant rights, and other actions to gain full civil rights. With a cast comprised nearly completely of people of color (only King George is played by a white actor), the musical sounds the echoes of the American colonies’ push for freedom and contemporary actions for equality. Hamilton’s rise from being an immigrant orphan to becoming one of the founding fathers of the new nation is a major plot driver in the show. Indeed, when Mike Pence went to see the show on Broadway, the cast spoke to him directly after the curtain call, making a plea for valuing immigrants’ contributions to American society. Want to experience Hamilton even if it’s not coming to your town any time soon – or if you don’t want to shell out hundreds of dollars for a ticket? First, listen to the original Broadway cast recording of the show – you’ll be listening again and again, mark my word! Second, buy the libretto, Hamilton: The Revolution . It includes extensive annotations by Lin-Manuel Miranda – giving insights into the rich history and dynamic artistic choices that went into the making of Hamilton. You’ll learn how he was inspired while on vacation by Ron Chernow’s outstanding biography Alexander Hamilton . You’ll learn how he built on and signified on previous rappers and hip-hop artists. You’ll also find article after article interspersed throughout the songs, again providing a vibrant backdrop to a truly amazing accomplishment. Finally, a PBS Great Performances documentary – Hamilton’s America – provides both a behind-the-scenes look at the show and actual performances from the show. I know you’ll be as mesmerized as I was. For great resources about Alexander Hamilton and the musical, visit the Great Performances website. Listen to the original Broadway cast recording of Hamilton, read the libretto, watch the PBS documentary, read the Ron Chernow biography that inspired Miranda to write the musical, and if you’re lucky, go see the show – and then join Alexander Hamilton and his compatriots as you “Rise up!” What a way to celebrate the Fourth of July! Watch:Watch as the Broadway cast performs “Alexander Hamilton” at the White House. You can listen to President Barack Obama talk about the importance of the musical. The cast’s performance starts at about nine minutes into the clip. Image Credit: Lin-Manuel Miranda as Alexander Hamilton. Photo by Steve Jurvetson. 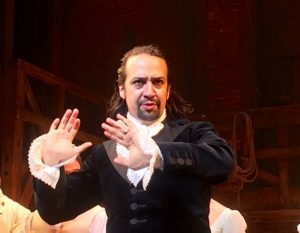 Used with permission, https://commons.wikimedia.org/wiki/File:Lin-Manuel_Miranda_in_Hamilton.jpg. I’m going to listen to my Hamilton CD again. Thanks for this Storyweb of such a great work. One of my local tour companies tried to get tickets for us to see the play here in St. Louis but couldn’t–instead -planned a trip to Chicago to see it but the price is pretty steep. I’ll listen to the CD again and read the text that goes with it. I thought my grandchildren would drive me mad with their endless repetition of the lyrics from Hamilton, which they learned by heart through incessant replaying of the cast album. Then during one long drive I actually listened to the words with them , and asked the kids to interpret what they were saying. I ended up getting a detailed history lesson from two 7 year olds and a 10 year old. Can you ask more than that from a musical?